The Center for the Book, New York: "A Book Conservator for an independent research library, Alice combines her knowledge of bookbinding with her interest in unusual book forms. 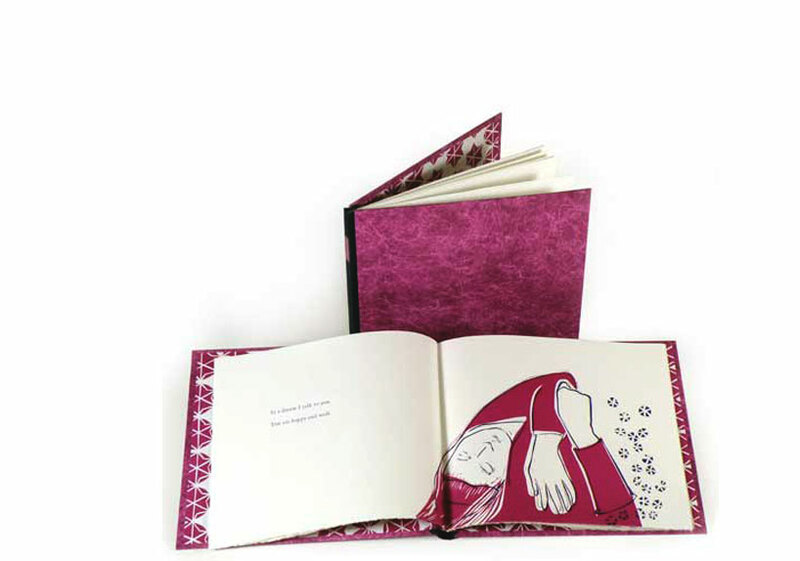 She creates artists' books that often function without words, using a sculptural approach to surprise and delight the viewer. A rich tapestry of color and texture make for complex, yet simply appealing artwork." Philadelphia, Pennsylvania: Alice Austin, 2016. Edition of 17. Tunnel book: 8" x 8" closed, extends to 8 x 8 x 12". Letterpress printed on a Vandercook press. Panels and sides are 4 overlapping letterpress-printed linoleum cuts. Printed on Mohawk cover weight paper. Housed in an ocean-blue box covered in Twinrocker handmade paper, printed with a linoleum cut image of seaweed, then paste paper painted. 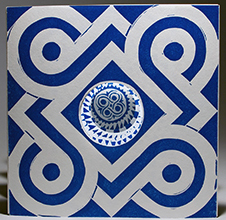 Box interior contains a linoleum print of a Celtic spiral design. Signed and numbered by the artist. 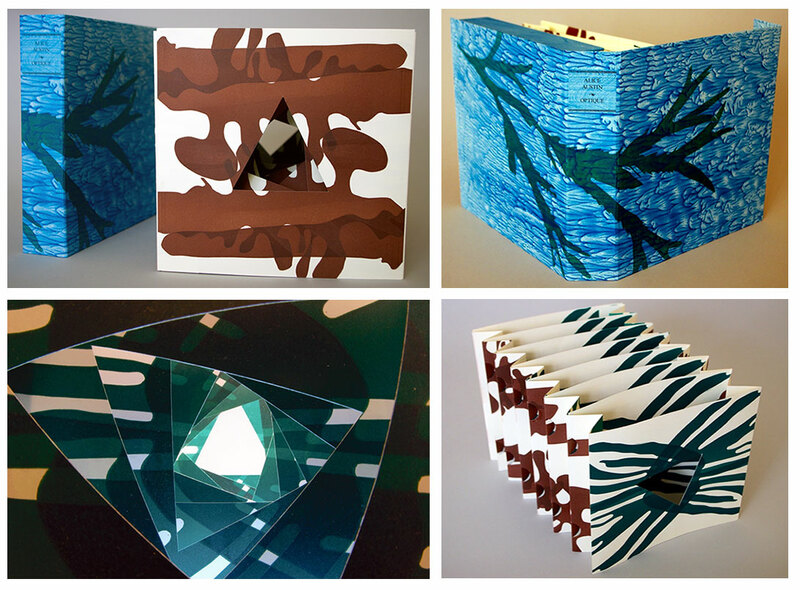 Alice Austin: "Optique is a tunnel book inspired by the wild, west coast of County Mayo, Ireland, echoing the unique coastal geometry of angular cliffs, blowholes, seaweed, and plants. The panels and the accordion sides are ... designs inspired by the forms and colors of seaweed and kelp of the Irish coast. 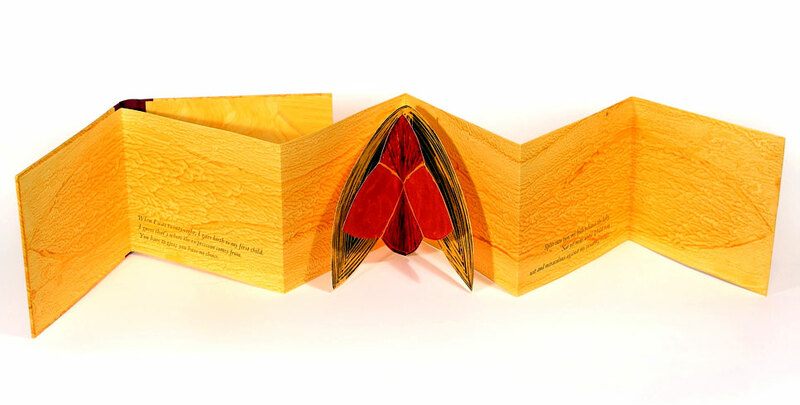 "The double-sided tunnel book also evokes a telescope, becoming an optical device. Looking through the opening, the eye sharpens its focus on an object at the other end." Philadelphia, Pennsylvania: Alice Austin, 2014. Edition of 20. 4" x 4" closed; 3 map folds. Reduction printing in yellow, red, and blue. Reverse side relief printed. In paper wrapper with printed title. Housed in archival box with paper title label on spine. Signed and numbered by the artist. Alice Austin: "A love of pie inspired this circular love letter of linoleum prints of pie. A reduction printing process was used to create prints in yellow (lemon), red (cherry), and blue (blueberry) with text – expressing love of another – printed on the yellow pie. The reverse side of each print is relief printed by hand from lace. 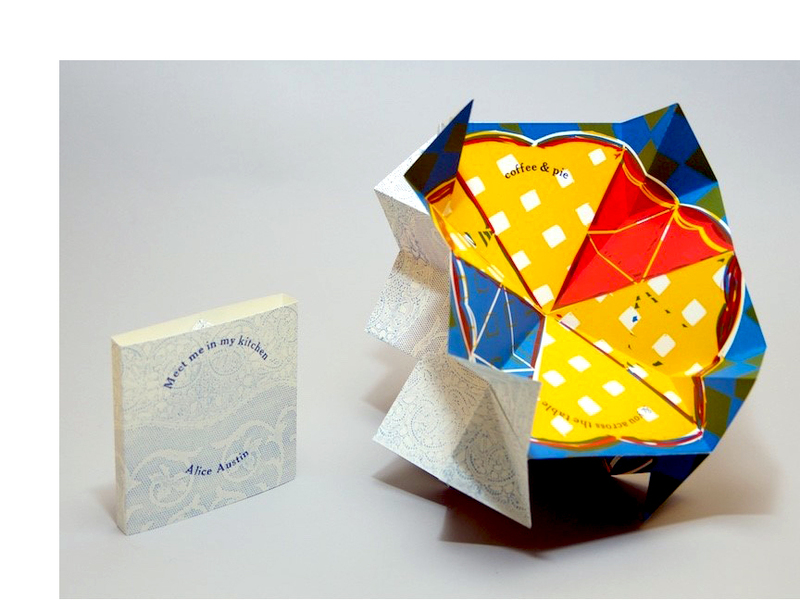 The three part circular map fold book is joined with a magnet which allows the book to stand." Philadelphia, Pennsylvania: Alice Austin, 2014. Edition of 24. Tunnel book: 7" x 7" x 1" closed, extends to 7" x &" x 10". Linoleum cut prints. Printed on Mohawk 80 lb. paper with a Vandercook press. Housed in an archival box with a linoleum print on the cover. Signed and numbered by the artist. Alice Austin: "Mosaic is a tunnel book that explores the experience of standing on the mosaic floor of the Basilica of San Marco in Venice, Italy. In the church the patterns are all encompassing and beautiful. The eye is drawn into a whirling vortex of pattern. Hand cut linoleum prints present details from the floor mosaics." Philadelphia, Pennsylvania: Alice Austin, 2010. Edition of 60. 5 x 5.25"; 11 pages plus title. 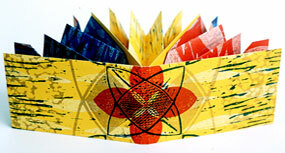 A one-sheet book printed by offset lithography in six colors. Required six runs through the Heidelberg Kors press at the Borowsky Center for Publication Arts. Laid in an illustrated letter fold wrapper. Signed and numbered by Austin and Snyder. Alice Austin: "Nolli, an exploration of textural layers of Rome by Alice Austin and Jon Snyder, was inspired by the Giambattista Nolli map of Rome, 1748. This project is the result of research done as a visiting artist at the American Academy in Rome. 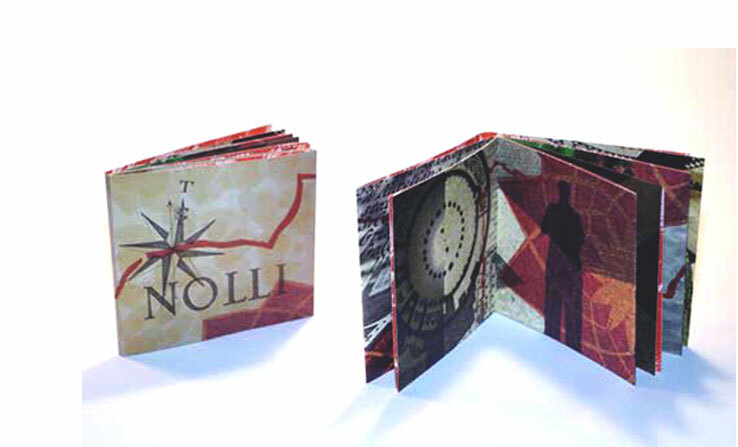 The front and back covers show elements from the Nolli map combined with a photo of a litho of the Roman fragments of the city map. The red line that continues throughout the book is the city wall and is shown on the reverse side of the map in white. The first page is a detail photo of the Nolli map. The second page is a watercolor of Bramante's Tempietto [a small commemorative martyrium]. The third page is Nolli. The fourth pages is Jon's shadow over my linoleum print of the [Piazza del] Campidoglio pavement. The fifth and sixth pages are photos of the Campidoglio. Pages seven, eight and nine are the first century pyramid of Caius Cestius. My feet are on the last page. The other side of the map unfolds to reveal a drawing of historic Rome and the architectural plan for St. Peter's." Philadelphia: Alice Austin, 2009. Edition of 40. 3.25 x 3.25 x 3.25" circular construction. Handset metal type and linoleum cuts printed on a Vandercook press. Paper – 50/50 from abaca/cotton and shredded money – handmade by Michele Wilson for the artist. 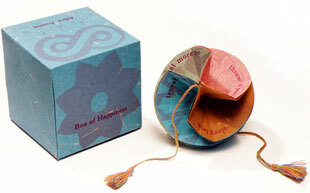 Housed in lidded 3.5 x 3.25 x 3.25" lightweight paper box, which may be in one of three colors: blue, green or brown. Jenna Krajeski, Alice Austin's Library, New Yorker Book Notes: "Normally when you pick up a book to add to your library you are concerned with what it contains, but sometimes all that matters is what it looks like." The construction is reminiscent of the children's toy (called a buzzer or buzz saw) in which twine or cord passes through something like a button, so that the suspended button can be picked up by the tails of twine on each side. If you hold the ends of the twine and toss the button in a circular motion, you twist the twine that can then be pulled taunt, and the button spins. Here Austin has substituted a ball of happiness – with pages that read "eat more pie," "travel far," "sleep late," "read a map," "buy shoes," "drink coffee,"throw a party." 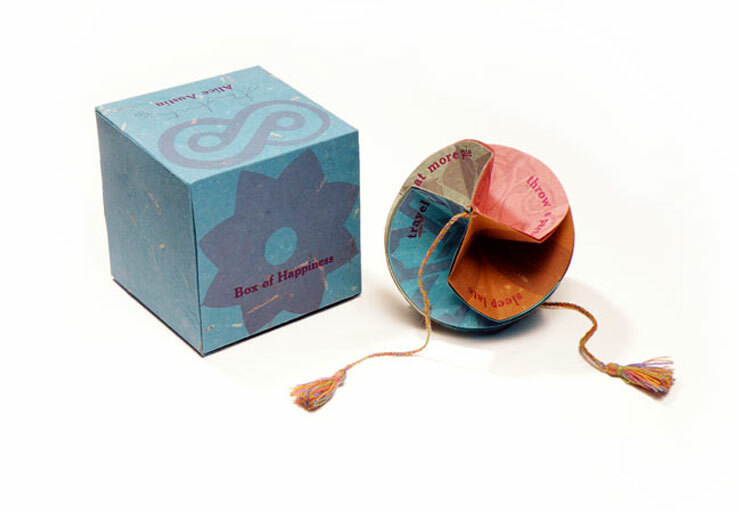 This Western version of the prayer wheel, Austin's ball is a happy spin of colors and words. Philadelphia: Alice Austin, 2008. Edition of 30. 7 x 8"; 14 pages. Printed on a Vandercook SP15 using hand-set type on Zerkall paper. Illustrated with linoleum cuts. Bound in painted tyvek boards with cloth spine. Alice Austin: "In dreams time is meaningless and my friend was as I knew her, years ago. Upon waking, she is gone and the idea of loss is multiplied, the loss of my friend, the loss of the past, and the loss of the possibility of connecting again. The book concludes with acceptance and a hopeful look to the future." 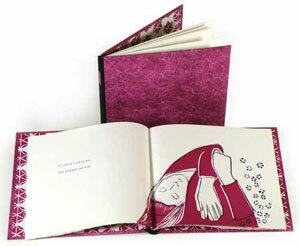 Susan Viguers, Director, MFA Book Arts/Printmaking Program The University of the Arts: "Dreams is a meditation on loss. Addressing first one who has died, then the self, then the reader, it moves from denial to acceptance to celebration. The words are printed on the verso, understated, suspended in space. We move from them to the images, which anchor us, some sinking off the page, elliptical and iconic." Philadelphia, PA: Alice Austin, 2007. Edition of 20. 4” x 6” closed; 16.5 x 9.8" open. Handset type printed on Twinrocker handmade paper with a Vandercook proof press. 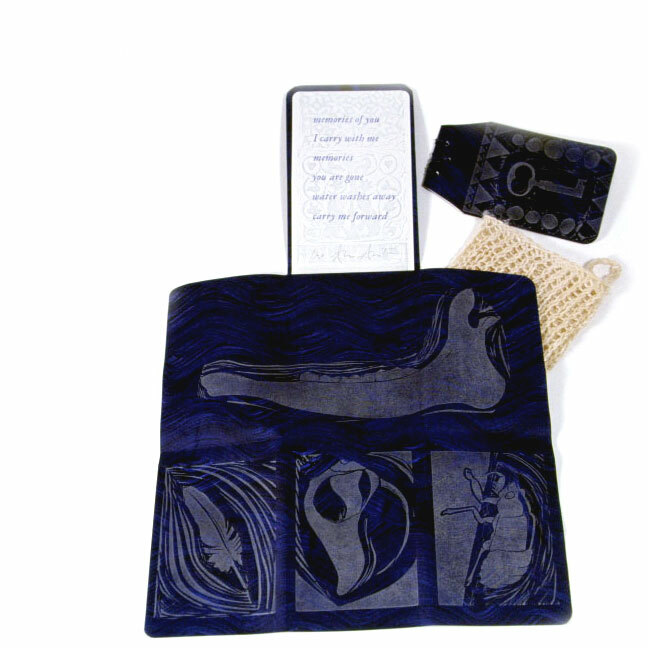 Illustrated with linoleum cuts on paste paper, which has been folded and attached to a wallet-style case. 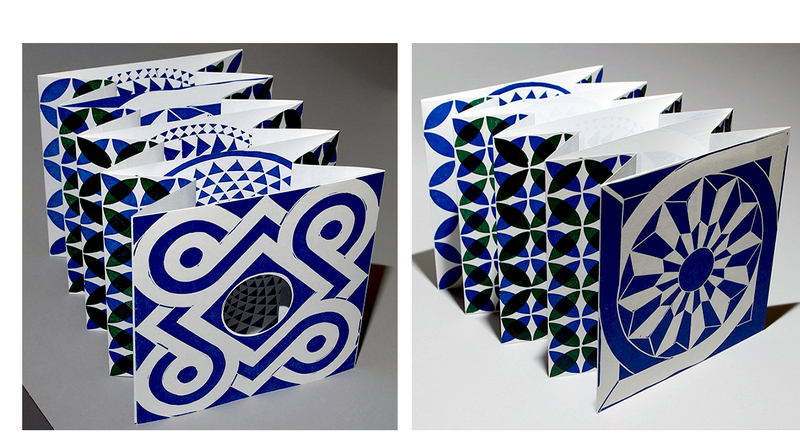 Additional pamphlet (5 x 3"; 3 leaves plus covers) laid into the folded paste paper. 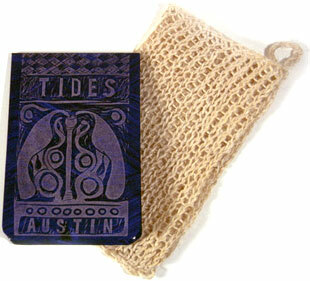 The wallet has been slipped into a hand-knit linen thread bag, evocative of a shroud. Housed in archival box with paper title on spine. Text by the artist. Alice Austin: “Tides is a book of memories both visual and poetic — a tribute to a loved one." And in a Podcast interview with Steve Miller, May 24, 2008: "[My] latest book is a memorial to my mother-in-law. I was having such a hard time grieving….So, I made the book in memory of her. That really helped me in the grieving process....It required dark blue paper ... which I then turned into a very dark blue paste paper. Imagery printed in silver with a little booklet of words that I wrote to memorialize her but not her specifically because in my work I like to have universal themes. Everything has to do with my life but I don't want it to be specific. I want anyone to look at it and bring their own experiences to it." Text: "memories of you / I carry with me / memories / you are gone / water washes away / carry me forward"
Philadelphia, Pennsylvania: Alice Austin, 2006. Edition of 15. 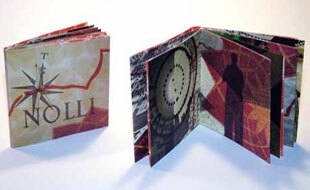 8 x 7" five pages with one double page pop-up. 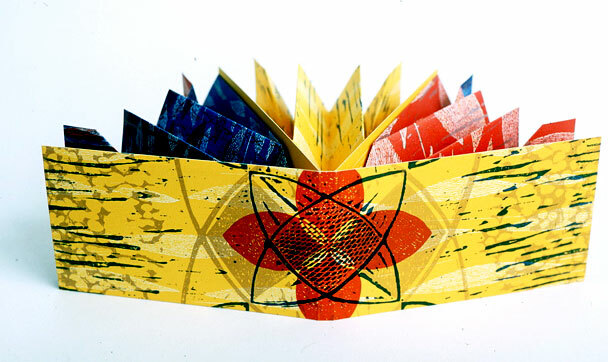 Paste paper monoprints extend in a long accordion with a central floral pop up. Printed on Rives heavyweight paper on a Vandercook proof press, using hand set type. Paste paper over boards with red cloth spine. Text written by artist. In an archival box. Alice Austin: "When I was twenty-eight, I gave birth to my first child. 'Bloom' is a book in which the topic of birth is both pondered and expressed." Philadelphia, Pennsylvania: Alice Austin, 2000. Edition of 500. 3 x 5" closed. 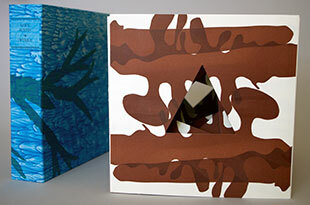 Printed offset lithography at the Borowsky Center for Publication Arts in Philadelphia. Three double pages pop-ups. Housed in matching paper open ended envelope. 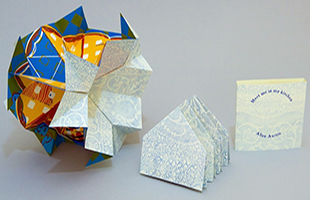 An interplay of color and paper engineering — simple like a flower. Philadelphia, Pennsylvania: Alice Austin, 2004. Edition of 16. 5.75 x 7.75" accordion structure. 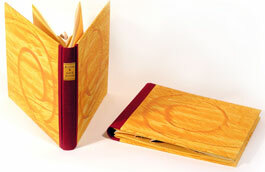 Cover is two etchings. Interior with four etchings on Rives lightweight. Foreground is relief printed on Mohawk coverweight. In archival box. 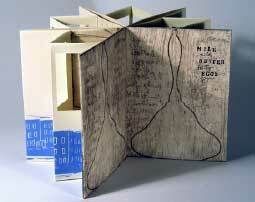 Alice Austin: "My book is a visual reflection on the repetition of the daily chores at my household. The cover is an abstract shape, perhaps a dinner bell, perhaps a feather duster, surrounded by a grocery list - the eternal milk, butter, eggs. The interior of the book has a foreground of the city block I live on - the endless row houses. When opened and set up, the book makes a geometric shape, a complete circle or a long line of all vertically oriented rectangles that echo the shape of the houses and the shape of the windows. Looking through the four windows you see the kitchen, then the laundry line and dishes (twice), and finally the view looking out of the kitchen while having a coffee break. The book is a quiet meditation on the routines of daily life. "